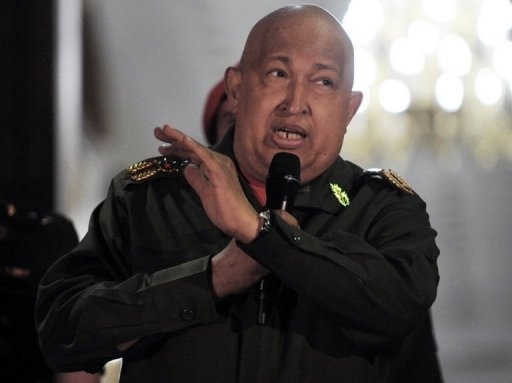 President Hugo Chavez challenged US President Barack Obama to prove US claims that four senior Venezuelan officials are involved in drugs and arms trafficking, as the foreign ministry formally protested US sanctions on the officials. President Hugo Chavez challenged US President Barack Obama to prove US claims that four senior Venezuelan officials are involved in drugs and arms trafficking. Washington on Thursday accused the Venezuelan officials of aiding the leftist Colombian guerrilla group FARC and put them on a list of narcotics kingpins subject to sanctions. "I challenge president Obama to show proof of this outrage," Chavez told reporters at the Miraflores presidential palace in Caracas. The US move "is part of the Yankee empire\'s determination to place Venezuela one day on the list of failed states or ... countries that support terrorism," Chavez said. Washington identified the men as Major General Cliver Alcala; ruling party lawmaker Freddy Bernal; Amilcar Figueroa, a delegate to the Latin American Parliament; and intelligence official Ramon Madriz. Chavez said he spoke out to "defend the honor of these four compatriots who were unjustly named on the list." Venezuelan authorities delivered a note of protest over the sanctions to the US embassy\'s charge d\'affairs Kelly Keiderling on Friday, the foreign ministry said in a statement. Relations have been tense between the two countries for years, and the countries have not exchanged ambassadors since late 2010. The US Treasury Department action on Thursday authorizes the seizure of any assets the four men may have in the United States and prohibits US citizens from doing business with them. The four were targeted for "acting for or on behalf of the narco-terrorist organization the Revolutionary Armed Forces of Colombia (FARC), often in direct support of its narcotics and arms trafficking activities," the Treasury Department said in a statement. The head of the department\'s Office of Foreign Assets Control described the four as "key facilitators of arms, security, training and other assistance in support of the FARC\'s operations in Venezuela."